New Aimpoint 3X-C Magnifiers Arrive! You are here: Home / Optics / New Aimpoint 3X-C Magnifiers Arrive! 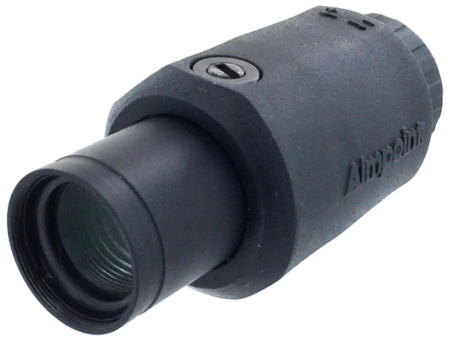 The new Aimpoint 3x-C magnifier provides a fixed 3x magnification. The Aimpoint 3x-C Magnifiers, which debuted at SHOT Show 2016, have finally arrived to authorized dealers. The original manufacturer of red dot, reflexive sights, has now produced the option of having a magnified view and target picture while using the shooters 1x Aimpoint sight. With available mounts that allow the magnifier to be locked off to the side, or a QD-mount the Aimpoint/3x Magnifier combination gives the shooter the best of both worlds – 1x reflex shooting, and 3x magnified shooting for distant targets. The new Aimpoint® 3XMag-1 and Aimpoint® 6XMag-1 are the higher grade products designed for use in the tougher (military) environments. The last few years of SHOT Show has definitely been dominated by reflex optics with magnification options. The benefits of magnification on reflex sights are many, and we’ll discuss those further in this article. 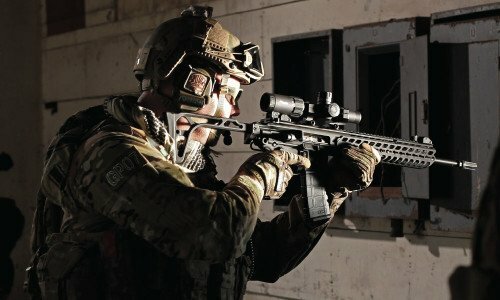 The benefits are especially important in the Patrol Rifle concept and application. These include the Vortex Strike Eagle 1-6x24mm, Vortex Crossfire II 1-4x24mm, Trijicon Accupoint 1-6x24mm, and Truglo Tru-Brite 1-6x24mm optics. For all of our articles on magnified reflex optics click here. 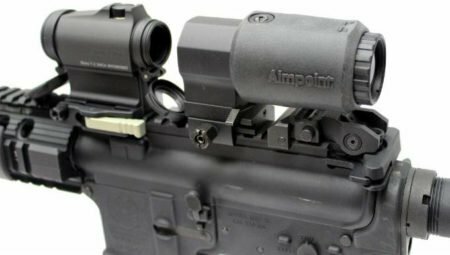 The Aimpoint 3x-C Magnifier is one of three new magnifiers offered by Aimpoint. Designed to be used with all Aimpoint sights, the 3x magnification gives the shooter better long-range aiming or observation abilities. Though specifically targeted to the civilian market, and 3-gun competitors, the Aimpoint 3x-C Magnifier has many more applications and would be a welcome addition to any law enforcement Patrol or SWAT rifle. The Aimpoint 3x-C Magnifier also comes with a variable (-2 to +2) dioptric setting, which allows shooter’s of various sizes and eyes to focus the magnified view for their personal benefit. Though not the most popular method of use the 3x-C Magnifier could also be used as a short to mid-range handheld monocular as well. The magnification is set at 3x, like many magnifiers. Like most magnifiers, Aimpoint magnifiers use the red dot in the reflex optic as the aiming reticle and not their own reticle, eliminating the need for re-zeroing when adding the magnifier. The shooter simply mounts the 3x-C magnifier behind the red dot sight and they’re ready to shoot more accurately at longer range targets with 3x magnification. Though 3x may not seem like much, it can actually provide a significant advantage for man-sized targets at distance. Aimpoint QD mount allows the 3x-C to be quickly mounted or removed. The 3X-C is encased in a shock absorbing protective rubber cover that also creates an ideal ergonomic grip. This is particularly valuable when the shooter selects the quick-attach/quick-detach mount or the flip-mount (both options from Aimpoint). The magnifiers may be used with the company’s quick-detach TwistMount™, or with the newly launched Aimpoint® FlipMount which allows the magnifier to be quickly flipped in or out of the optical axis, or removed from the firearm completely. 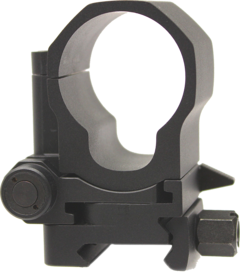 Besides Aimpoint, there are several competitors with options for QD or flipmount options. The Aimpoint Flipmount gives the fastest reflex or magnified selection. The flip-mount would be my personal preference for police work. In close quarters searching the 3x-C could be flipped and locked out-of-the-way for very fast reflex shooting. If greater distances are being confronted, the fast click into place gives the shooter quick magnified shooting ability. Internal optical adjustments provide for aligning the magnifier and the red dot sight quick and easy. The 3x-C is literally designed to be a mount and go option. 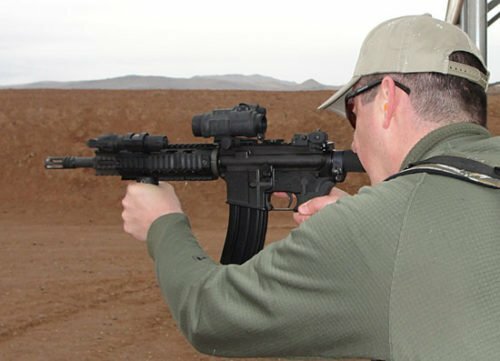 The Author shoots an AR-15 with 14.5″ barrel and red dot optic. The advent of red dot and other forms of “reflex” shooting optics has truly revolutionized the shooting community. Everyone from military and law enforcement shooters, to competition and civilian shooters have found reflex optics to be highly beneficial. Once the shooter has zeroed their red dot, it is incredibly fast to come on target by simply placing the red dot where the shot is desired. Instead of traditional aligning of front and rear iron sights, or magnified crosshairs, the red dot is literally point the dot and shoot. This optic selection is perfect for short and mid-ranges, and can be very accurate. U.S. Army soldiers train with magnified optics (photo by U.S. Army). Traditional magnified optics were only found in variable and fixed scopes. Though these scopes made shooting longer range shots much easier and accurate, they really suffered for close-in and reflexive shooting situations. As the field of view narrows (through magnification), the ability to track and keep the cross hairs on a close target becomes more difficult. Thankfully competitive shooters and the military saw the need to have both reflexive shooting and more precise longer range shots. Initially this led to the use of add-on magnifiers to enhance an existing reflex optic. The Aimpoint 3x-C is designed for just that purpose. However, adding another component to an often already heavy rifle can become very burdensome. The Trijion Accupoint 1-6x24mm scope has a threaded magnification dial for optional lever (the Accupower is the 1-4x24mm version). This has fueled the most recent trend in rifle optics – the new variable magnification reflex scopes like the Vortex Crossfire II and Trijicon Accupower. Both of these quality scopes give the shooter the choice of a 1x reflex optic, or up to 4x magnification for better accuracy at distance. A simple twist of the magnification ring or lever allows the shooter to dial the scope to their immediate needs. In the vast majority of situations I have faced on both Patrol and SWAT, a reflex optic on my AR-15 has been sufficient. However, recently my S.W.A.T. Team participated in an annual regional Advanced SWAT course. 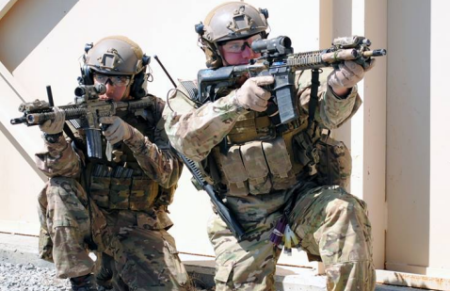 The training takes place on one of the best Army National Guard bases in the midwest, complete with significant ranges, MOUT site, and even a Shoot House. One of the courses involved the Rifle Ivan course, where Army troops perform their standard rifle qualification. Just a couple of months before this training we had transitioned to Aimpoint Carbine Optics over our previous EOTech optics. The EOTech, with its outer ring, actually was designed for making adjustments for extremely close shots as well as distance shots. 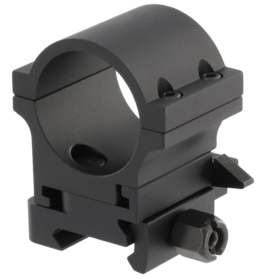 The Aimpoint PRO comes with flip-up lens covers, QD rail attachment, detachable riser, and cap securement straps. On most of the rifle ranges, including the Shoot House, the use of our Aimpoint Carbine Optics were just fine. The ACO gave each shooter a fast target acquisition, in both daylight and low-light conditions, and were proven to be very accurate as well. The single dot of the Aimpoint makes aiming very quick and rather easy as well. However, on the Rifle Ivan course the single red dot from our reflex Aimpoint Carbine Optics began to meet its limitations. In this particular situation, having a magnifier or a variable magnification scope would have been very beneficial. Prone shots from the ground at the adjacent box roof. Targets pop up in a pre-set pattern moving from short to long and in between. The Army qualification course requires 20-shots from standing, with only (1) shot per target. The shooter then moves to kneeling and fires 10-shots, and finishes with 10-shots from prone. Target distances are the full range from the standing and prone positions, and from 50-200 meters kneeling. On all but the 250 and 300 meter shots we were able to make quick work of the targets. I was able to make adjustments on the 250 meter target and get most of my hits at that range, but my 300 meter shot was mostly guess-work, with below 50% hits. I had one round at 36 of 40 making “expert” on the Army qualification, but a magnified view would have been much more advantageous. A variable magnfication scope like the 1-6 x 24mm Sig Sauer Tango 6 takes up about the same space as a red dot/magnifier combination. We love to see the advancements in firearms, ammunition, and optics. Over the last 20 years they have come fast and furious and the end result for the shooter is simply fantastic. 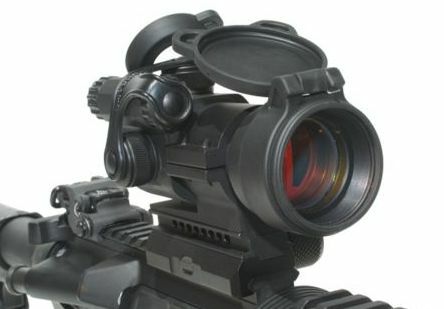 The Aimpoint 3x-C Magnifier is one of those products. The enhancement provided by a magnifier cannot be overlooked, and in my opinion should be a serious consideration for any police rifle. The Aimpoint 3x-C is a well-built magnifier with very good clarity. We were able to handle the prototypes at SHOT Show and have been anxiously awaiting their arrival. They would make very good add-ons to any red dot optic, though they are specifically made for Aimpoint optics. My only real concern is the same with all Aimpoint products: the cost. The MSRP for the 3x-C is $307.00. Though we know the 3x-C can be found for under $300, the price is as much or more than many quality red dot optic selections. For instance, the Vortex VMX-3T magnifier for half the price of the Aimpoint 3x-C.
For that reason I would select a variable magnification scope like the Vortex Strike Eagle or Crossfire II, and get the best of both options in one optic, and for less money!